"Gimme Shelter" is a song by the English rock band The Rolling Stones. It first appeared as the opening track on the band's 1969 album Let It Bleed. Although the first word was spelled "Gimmie" on that album, subsequent recordings by the band and other musicians have made "Gimme" the customary spelling. The Rolling Stones first played the song live at Colorado State University, Fort Collins, CO on 7 November 1969. Greil Marcus, writing in Rolling Stone, once said of it, "The Stones have never done anything better." "Well, it's a very rough, very violent era," said Richards. Vietnam War. "Violence on the screens, pillage and burning. And Vietnam was not war as we knew it in the conventional sense..." As for the song itself, he concluded, "That's a kind of end-of-the-world song, really. It's apocalypse; the whole record's like that." "It was a very moody piece about the world closing in on you a bit ... When it was recorded, early '69 or something, it was a time of war and tension, so that's reflected in this tune. It's still wheeled out when big storms happen, as they did the other week [during Hurricane Sandy]. It's been used a lot to evoke natural disaster." The Rolling Stones are a British rock band formed in London in 1962... Rolling Stone magazine ranked them fourth on the "100 Greatest Artists of All Time" list... In 2008, Billboard magazine ranked the Rolling Stones at number ten on "The Billboard Top All-Time Artists" and as the second most successful group in the Billboard Hot 100 chart. Gimme Shelter is a 1970 documentary film directed by Albert and David Maysles and Charlotte Zwerin chronicling the last weeks of The Rolling Stones' 1969 US tour which culminated in the disastrous Altamont Free Concert. 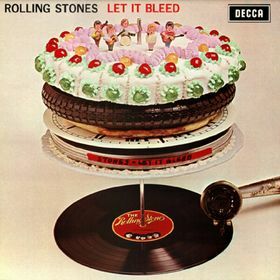 The film is named after "Gimme Shelter", the lead track from the group's 1969 album Let It Bleed. The Altamont Speedway Free Festival was an infamous rock concert held on Saturday, December 6, 1969, at the Altamont Speedway in northern California... It featured, in order of appearance: Santana, The Flying Burrito Brothers, Jefferson Airplane, and Crosby, Stills, Nash & Young, with the Rolling Stones taking the stage as the final act. The Grateful Dead were also scheduled to perform, but declined to play shortly before their scheduled appearance due to the increasing violence at the venue. "That's the way things went at Altamont—so badly that the Grateful Dead, prime organizers and movers of the festival, didn't even get to play," staff at Rolling Stone magazine wrote in a detailed narrative on the event, terming it in an additional follow-up piece "rock and roll's all-time worst day, December 6th, a day when everything went perfectly wrong." Approximately 300,000 people attended the concert, and some anticipated that it would be a "Woodstock West." Filmmakers Albert and David Maysles shot footage of the event and incorporated it into a documentary film titled Gimme Shelter (1970). The event is best known for having been marred by considerable violence, including the death of Meredith Hunter and three accidental deaths: two caused by a hit-and-run car accident and one by drowning in an irrigation canal. Four births were reported during the event. Scores were injured, numerous cars were stolen and then abandoned, and there was extensive property damage.